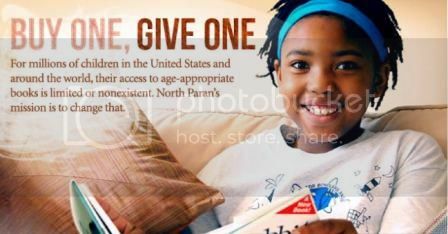 A new website has launched that could place books in the hands of thousands of black children across the globe: NorthParan.com. The online retailer is adding a philanthropic touch to the business of selling black books by donating a book to a child in need for each book sold. The site’s slogan is Buy One, Give One. Their goal is to donate 100,000 books for Black History Month. To make the donations, North Paran partners with non-profit organizations in the United States and abroad to find children who do not have access to new books. Neil Nelson, the site’s co-founder, is driven by the memories of his childhood in Jamaica, when his family only had five books in the house that he and his sister had to share. But Neil read those five books over and over, until he had all the words memorized. Now he wants to change this bleak picture for as many children as he can. After starting a vastly successful celebrity news and video site that reached nearly 30 million unique visitors last year, Neil partnered with husband-and-wife authors Nick Chiles and Denene Millner to create NorthParan.com, a cutting-edge site that will publicize black books and nourish black children. Chiles and Millner have written or co-written 19 books between them — Millner is the co-author with Steve Harvey of the #1 New York Times bestseller “Act Like a Lady, Think Like a Man,” which was the top-selling nonfiction book in the country in 2009, and the sequel “Straight Talk, No Chaser,” which has already reached #1 on the New York Times list. Chiles co-authored with gospel legend Kirk Franklin “The Blueprint,” which also was a New York Times bestseller last year. Millner and Chiles are both also award-winning journalists and the parents of three children of their own. Visit the site at www.NorthParan.com.